It means different things to different people to “show up.” One doesn’t need to look hard to find the disparities. The mother “playing with her kids” while she’s frantically typing out emails on her phone. The father who’s at the soccer game but can’t remove the phone from his ear. The friend who makes it to your dinner party but takes no interest in your other guests. It goes on forever. So what does it mean to show up? Does it require talking to everyone at every social gathering? That you never ever check your cell phone while your kids entertain themselves with Legos? Surely, there’s a case to be made that that is what it means. It means being there as well as anyone could imagine. And for some people to not be a bubbly social butterfly who is 100% on just doesn’t cut it. But even at my best I’m not able to be a bubbly social butterfly half as well as some are without any visible show of effort. Maybe for you, giving anything your undivided attention just doesn’t feel possible. So I think there’s something to be said for realism. Whether or not you’ve “shown up” adequately is always a judgment call. You’ve got to make it for yourself, and others will also make it about you. The times when you think you’re being there for your daughter and she feels different are where the rubber of this whole thing meets the metaphorical road. For me, showing up means making the best effort I know how, and hopefully to the satisfaction of the person or people I feel I’m showing up for. If I don’t feel I’m really making a strong effort but they feel I have, that’s nice but not sufficient. And if my best is not good enough to people in my life, I pray for their patience. And I’m open to making changes based on their advice. What it comes to is that what it means to show up isn’t one thing. And this leads to a lot of heartache. But the solution to that heartache isn’t to define it down into some Platonic ideal. It’s to be honest, forthright, and ready to listen if someone asks to reconcile a disparity. And it means being willing to start that conversation, too. What we need are frank discussions about what showing up means to everyone involved. To be honest and thorough and empathetic as we work through the difference of opinion. And showing up for that conversation is the most important thing in the world. So next time you’re walking your dog, and someone asks you if you’re going to pick that up, do the right thing. Say yes and walk away. Leave the excrement where it falls. And even when I wrote that, I wasn’t nearly so certain as it sounds. I expect I was mostly just excusing the fact that I didn’t pick up dog poop at the time. Soon after that I had a change of heart. Though it would be useful to have a nice transformational moment when I realized how foolish my old logic had been–how I accidentally stumbled into a large pile of dog feces while walking in shiny new shoes–there is not one. The simple reality is that at the time I was proudly declaring that one shouldn’t pick up dog poop, I was really just scared of the stuff. And reasonably so. 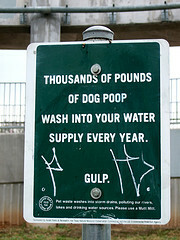 Excrement of all kinds carries more bacteria than just about anything else we regularly encounter. And it’s certainly the most unsafe thing our bodies–and dog’s bodies–regularly expel. But, I realized one day, it’s safer for everyone if I pick that stuff up with a layer of plastic between me and it, and then wash my hand before it goes anywhere near my mouth. It’s safer there than on a third grader’s shoe. Or a 67 year old’s. Safer too than having a mistaken toddler play with it. Safer than it having it leach into the water supply–an odd claim I’d never heard until I saw the above picture. I still have reservations about the whole thing. Mostly it’s this: I’m sealing biodegradable waste inside a painfully-slow-to-erode plastic bag, where it will take up landfill space for hundreds of years. Now the plastic bag may have well ended up in the landfill anyway, but the poop could be, as I suggested last time, reasonably good fertilizer.